Print custom window stickers and buyers guides for your vehicles any time – right from your desktop. 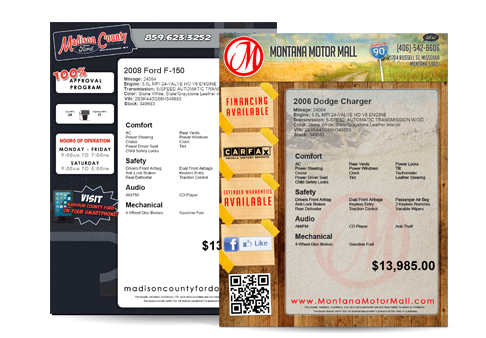 Our design team will create a visually stunning custom sticker for your dealership, and we’ll send you the stickers with the design pre-printed, so all you’ll have to print out is the vehicle information. You won’t even have to download any additional software – the stickers print directly from inside our AutoRevo system. Because you control the inventory, you have the most accurate options list displayed with the most up-to-date prices. Reprinting damaged stickers and buyers guides is quick and easy. You can order more window stickers and buyers guides at any time by contacting your Account Manager or by calling the Support team.